In her novel Living With It Lizzie Enfield tackles the subject of how the choices one person makes can drastically – and yet unintentionally – alter the lives of other people. She explains here how one of the photos she kept on her computer desktop (shown below) became a part of her writing the book. 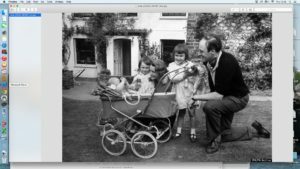 This is a photo of Roald Dahl with his wife and three children. He’s standing next to his daughter, Olivia, to whom he dedicated two of his books, James and the Giant Peach and The BFG. Olivia died of measles, aged 7 in 1962, just two years after the picture was taken. This happy family was shattered by a childhood disease which is now entirely preventable. It makes you think doesn’t it? It makes you wonder why so many people still choose not to have their children vaccinated, putting their own children – and other people’s – at risk. Dahl wrote a heartbreaking essay about losing his daughter. “I was sitting on her bed showing her how to fashion little animals out of coloured pipe-cleaners, and when it came to her turn to make one herself, I noticed that her fingers and her mind were not working together and she couldn’t do anything. ‘Are you feeling all right?’ I asked her. ‘I feel all sleepy,’ she said. In an hour, she was unconscious. In twelve hours she was dead.” The author described it as “almost a crime to allow your child to go unimmunised”. I agree. All children should be vaccinated, not least to protect those too young or too vulnerable to receive the vaccine. It’s easy to forget how dangerous childhood diseases, which had almost been eradicated due to a successful vaccine programme, were. This is the issue at the heart of my latest novel, Living With It. It’s about a group of old friends. One member of this group has never had her children vaccinated. Her teenage daughter catches measles while they are holiday with another couple who have a young baby. The baby catches the virus and is left profoundly deaf as a result. This is not an implausible “what if” scenario. The legacy of the MMR scandal, which began in 1998 when Dr. Andrew Wakefield proposed a link between the MMR vaccine and autism is still leading to large numbers of parents choosing not to vaccinate their children. He has since been discredited and struck off but the fear his report generated prevailed, leaving a large number of children unprotected against a disease which is more infectious than smallpox and has serious side effects including, deafness, blindness and brain damage. One person died and many were injured after the UK outbreak in 2012. There will be more children and vulnerable people damaged in the current outbreak in the US. In the immediate aftermath of the Wakefield report’s publication, my middle daughter was due to have her MMR jab. Naturally I was worried. Who wouldn’t have been? Autism was on the increase and measles was a distant memory. But I took the plunge, aware that measles had not been eradicated. But what if I’d been too scared to have my kids vaccinated and they’d caught measles when it re-emerged? What if they’d passed it on to the baby of a friend and their baby had been damaged or worse? Could I have lived with the consequences of a decision made years previously? These are questions the central characters in the book have to face. It’s a novel, not a polemic. It is, I hope, a compelling story, told with humour, insight and sympathy for all the characters involved. But I also hope it will make people think, as the picture of the Dahl family picture made me think every time I looked at it on my computer desktop. Seeing them all looking so happy, knowing that two years later, that happiness would be shattered, you can’t help but wonder why anyone would risk the health of their own children or put those of others at risk by not having them vaccinated. Look at them all. 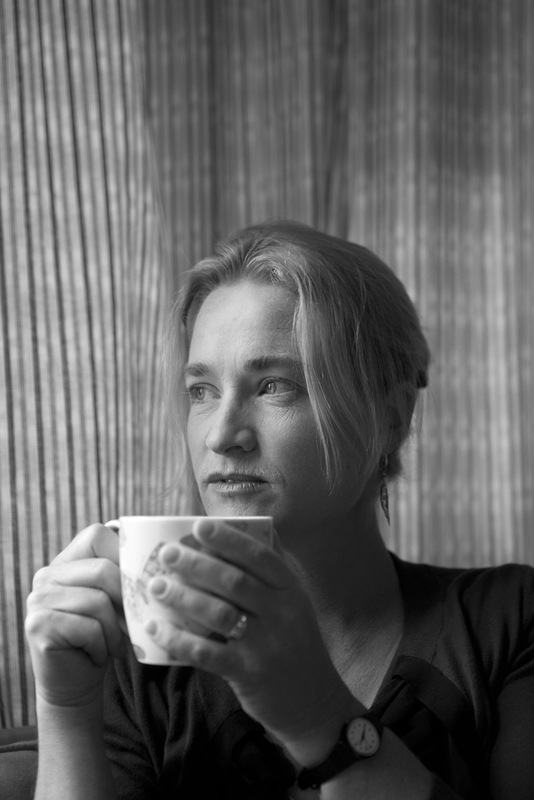 Lizzie Enfield is a journalist and regular contributor to national newspapers and magazines, has written two novels – Uncoupled and Living With It – and had short stories broadcast on Radio Four and published in various magazines. She has taught for the Arvon Foundation, various universities, writes a monthly writing column for Writing Magazine. Lizzie also teaches creative writing at the Writers Room in Brighton with Araminta Hall.